Circles are simple to work with in pre-calculus. A circle has one center, one radius, and a whole lot of points, but you follow slightly different steps, depending on whether you are graphing a circle centered at the origin or away from the origin. 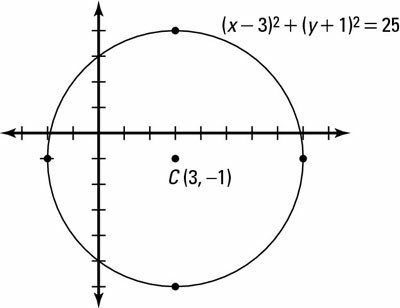 The first thing you need to know in order to graph the equation of a circle is where on a plane the center is located. The equation of a circle appears as (x – h)2 + (y – v)2 = r2. This is called the center-radius form (or standard form) because it gives you both pieces of information at the same time. The h and v represent the coordinates of the center of the circle being at the point (h, v), and r represents the radius. Specifically, h represents the horizontal displacement — how far to the left or to the right of the y-axis the center of the circle is. The variable v represents the vertical displacement — how far above or below the x-axis the center falls. From the center, you can count from the center r units (the radius) horizontally in both directions and vertically in both directions to get four different points, all equidistant from the center. Connect these four points with the best curve that you can sketch to get the graph of the circle. Set r2 = 16. In this case, you get r = 4. Graphing a circle centered at the origin. Although graphing circles at the origin is easiest, very few graphs are as straightforward and simple as those. In pre-calculus, you work with transforming graphs of all different shapes and sizes. Fortunately, these graphs all follow the same pattern for horizontal and vertical shifts, so you don’t have to remember many rules. Don’t forget that the coordinates of the center of the circle are of the opposite signs of the h and v from inside the parentheses in the equation. Because the h and v are inside the grouping symbols, this means that the shift happens opposite from what you would think. 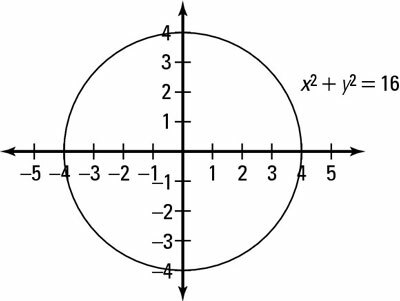 (x – 3)2 means that the x-coordinate of the center is positive 3. (y + 1)2 means that the y-coordinate of the center is negative 1. Set r2 = 25 and square root both sides to get r = 5. Count 5 units up, down, left, and right from the center at (3, –1). This step gives you points at (8, –1), (–2, –1), (3, –6), and (3, 4). Graphing a circle not centered at the origin. The figure shows a visual representation of this circle.